I expect all historians can think of one or two moments in history they would really like to have seen for themselves (often, it must be said, from a safe distance). As a great fan of the early Royal Society, I’ve often wondered what it would have been like to attend one of the Society’s weekly meetings in the 17th century. Judging from the minutes of the meetings, the conversation could range over almost any topic imaginable, and there was always the possibility of a monster of some kind being brought in to liven up the proceedings. This is all by way of introduction to a passage in the minutes recording a conversation that took place on 28 November 1678 about how to render a coal-mine safe to enter (and like so many aspects of Restoration life, I don’t advise trying this at home).
. . . it shook the earth for a considerable way round about, and carried some miners, who were going down into it, a very great hight into the air, and blew up also aloft into the air all the building, that stood over and about the mouth of the mine. History does not record whether the poor miners survived being blown a very great height into the air – but Sir Paul Neile followed this up by relating the ‘cure’ for this problem, which was ‘found out accidentally’ by miners working for Sir William Lampton. From the fact of Lampton having passed this story on to Sir Paul Neile, it seems as though he approved of the practice of his miners throwing lighted coals into the pit every morning. Perhaps he thought it was preferable to them throwing lighted coals at each other. What, you may ask, does this have to do with Hooke? Well, he was present at this conversation although for once he seems not to have proffered an opinion. But more importantly, his and Robert Boyle’s experiments with the vacuum or air-pump contributed to the understanding of air, and the conditions necessary for combustion. 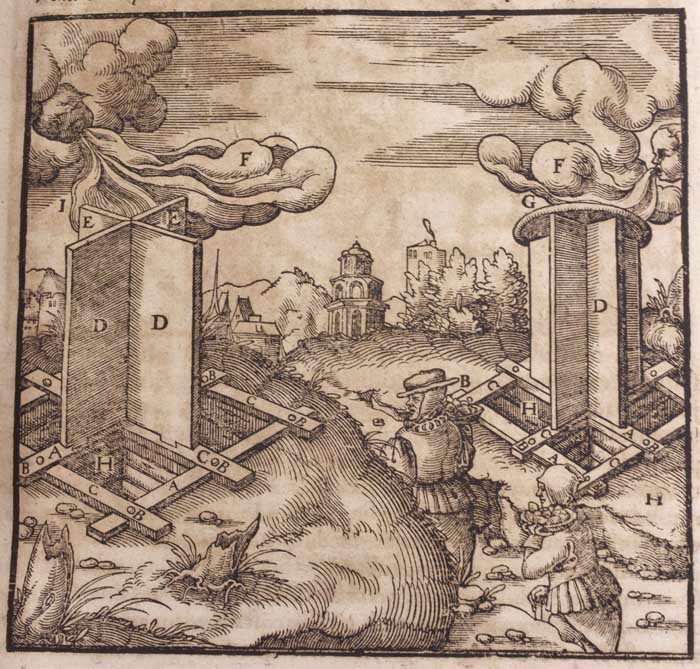 I’ll finish with one of the lovely woodcuts from Georg Agricola’s early mining manual ‘De Re Metallica’ (1556), which shows a design for a shaft ventilation system directing wind down into the mine. This entry was posted in The Royal Society and tagged Agricola, drunkenness, mining, Royal Society by felicityhen. Bookmark the permalink. It’s a wonder any of us are here these days with antecedents like that. But many great discoveries are serendipitous if you only keep your eyes open. Indeed! I really like this story because it encapsulates the ‘have a go’ attitude and sheer curiosity of the early Fellows of the Royal Society. Thanks for reading.